This was an amazingly fun drawing to work on. I wanted to put across the feeling of shade on a hot day, with sunlight filtering through in places. 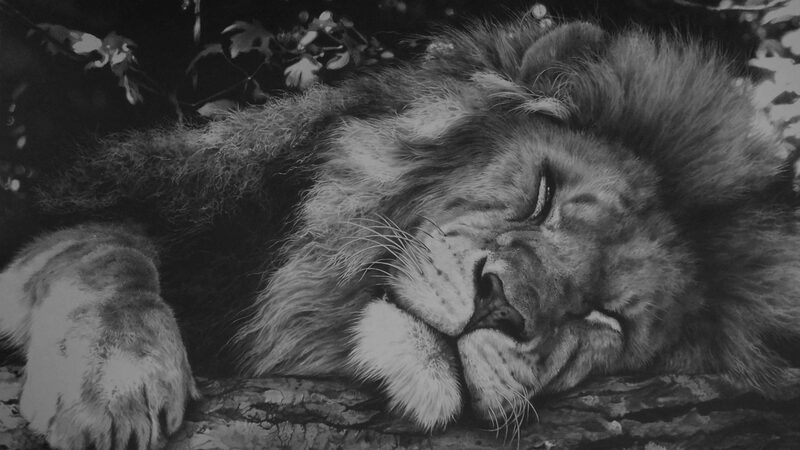 The lion I drew is such a big male, in his prime and he looked so peaceful sleeping. I felt like I could almost stroke him, but just a few minutes earlier he’d been running and was truly powerful! This drawing took many weeks as I worked on it alongside some others (inc Leopard portrait) My favourite part was drawing the fantastic leaves in the background. They are slightly out of focus to draw attention to the details on the lion. His mane was the hardest part, taking most of my time. Please feel free to email me with any questions or check out my Blog for more details about current works in my studio along with tips and videos.